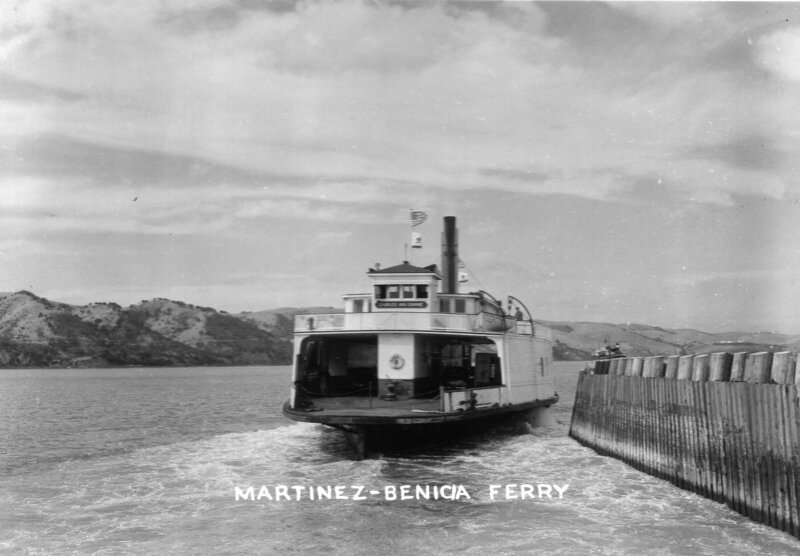 Ferry service in Benicia dates back to 1847 after Robert Semple and Thomas Larkin purchased the City’s section of the Suscol Grant from Mariano Guadalupe Vallejo. 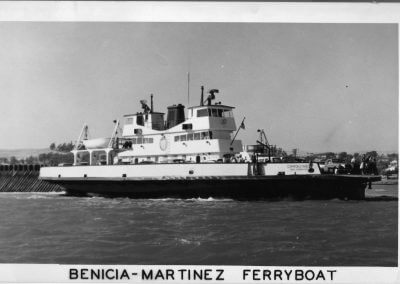 One of the conditions set by Vallejo for the sale of the land grant acreage was that a ferry service operate between Benicia and Martinez. 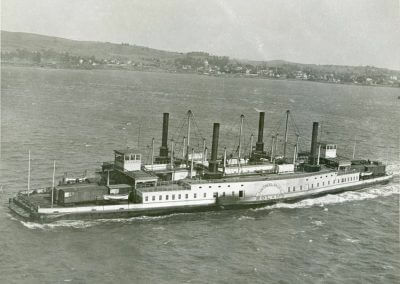 Unfortunately, there is not a lot of information about the first ferry, but one of the early passengers was Lt. William T. Sherman who made frequent visits to the Benicia Arsenal. He remarked, “This ferry was a ship’s boat, with a lateen (triangular) sail, which could carry across at one tide six or eight horses.” It wasn’t until 1851 that the IONE, a steam powered ferry, was started by Captain O. C. Coffin. In 1859, Coffin and his brothers Charles and Henry extended the ferry service by building at Benicia a steamer called the CARQUINEZ. It was condemned by inspectors in 1881 and ceased service after operating for 25 years. When the ferry BENICIA was built in Martinez in 1881, it was ten feet longer than the old CARQUINEZ. It was reported in the Contra Costa Gazette “… that the boat is the best ferry on the Coast, outside of the Oakland and San Francisco ferryboats”. 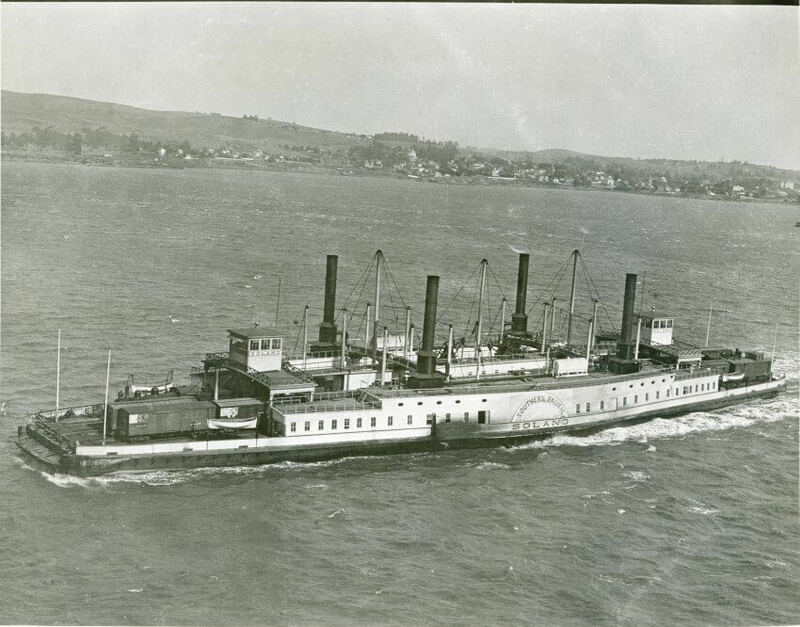 Its service, however, was short-lived because of the competition of the boat SOLANO, the largest train ferry in the world at that time which carried foot passengers as well as trains. There was great excitement in 1879 when the SOLANO was put into service and given a 26-gun salute from the Benicia Arsenal. The SOLANO was in service until approximately 1913. Ferry services increased dramatically after the introduction of the automobile. By 1915, the steamer CITY OF SEATTLE was put into service to carry early automobiles as well as foot passengers and operated until 1943. 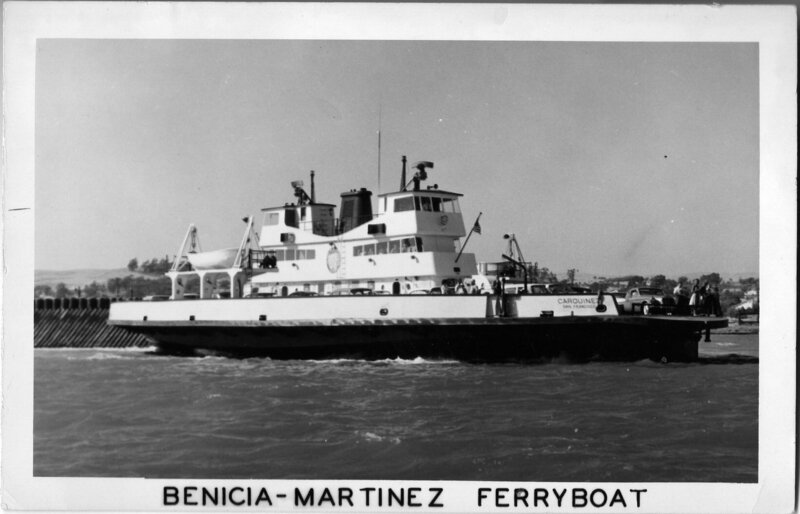 From 1917 to 1962 other automobile and passenger ferries plied the waters between Benicia and Martinez: the CITY OF MARTINEZ (1917-1929), the ISSAQUAH (1927-1943), the CHARLES VAN DAMME (1943-1956), the CITY OF SAN RAFAEL (1944-1956) and the CARQUINEZ—the second (1956-1962). The CARQUINEZ was nicknamed “little toot”, undoubtedly after the character in the popular children’s book of the same name, and became the last auto ferry to ride the Bay in 1962, a victim of the welcome and much-needed progress made in the area’s building of new auto routes and bridges.